“The tour’s been amazing so far. I know it sounds cliche to say…but we’re having more fun than we did last year,” Jeff tells ABC Radio. As for who’s coming out to see them, Jeff says their original fans are back… and bringing their kids with them. 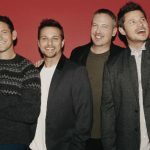 98 Degrees wrap up the Christmas tour December 21 in Wisconsin. So what’s next for them? According to Jeff, new music, because that’s what their fans want.